Silkroad Online Forums • View topic - What is Blue Screen Of Death aka BSOD? What is Blue Screen Of Death aka BSOD? Post subject: What is Blue Screen Of Death aka BSOD? FIRST LET ME START BY EXPLAINING WHAT IS BSOD? The Blue Screen of Death (BSOD, bluescreen, or stop error) is an error screen displayed by certain operating systems, most notably Microsoft Windows, after encountering a critical system error. Bluescreens can be caused by poorly-written device drivers, faulty memory, a corrupt Registry, or incompatible DLLs. Bluescreens have been present in all Windows-based operating systems since Windows 3.1; OS/2 and MS-DOS suffered the Black Screen of Death, and early builds of Windows Vista displayed the Red Screen of Death after a boot loader error. 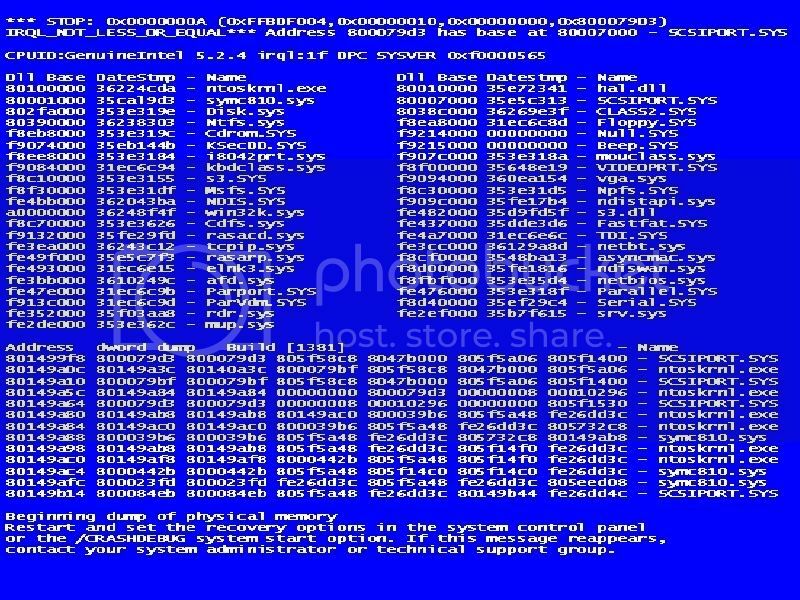 The blue screen of death (BSOD) is the informal name given by users to the Windows general protection fault (GPF) error. Named in honor of the error's dreaded display image of white text on a blue background, the BSOD is generated by the operating system when it has suddenly terminated with an error. The system locks up and must be rebooted. The blue screen may include some hexadecimal values from a core dump that can potentially be used to determine what caused the crash. The blue screen of death can strike anyone, anywhere. WHAT SHOULD I DO WHEN I GET A BSOD? 3. Try to reboot your computer to check if it boots normally to Windows. PS – Follow Step 5 only for XP and Vista users. For other OS (95 / 98 / 2000 / ME / NT) proceed to Step 7. 6. If System restore does not fix proceed to Step 7. 7. Make sure any new hardware or software is properly installed. Unplug each new hardware device, one at a time, to see if this resolves the error. Replace any hardware that proves faulty by this test. Also, try running any hardware diagnostic software supplied by your computer manufacturer. If this is a new installation of hardware or software, contact the manufacturer for any Windows XP Professional updates or drivers you might need. Finally if none of them work its better to back up data and reformat the HARD DRIVE. For backing up data, I would recommend to contact some local software technician or any data back up company. •the screen displayed by the OS/2 operating system in the event of either a system error from which it cannot recover (a TRAP screen) or a "hard" error in a program running in "full screen" mode (a less serious application failure). •The black screen of death has been present in all versions of OS/2. Windows 95, 98, 2000, ME, XP, and the official release of Windows Vista also display a Black Screen of Death when the operating system cannot boot. This is usually due to a missing file. Oftentimes, the user must reinstall Windows. A black screen can also be caused by display driver problems, or selecting a mode that the monitor cannot display, though this may result in a warning on the monitor or even in damage to a CRT monitor if it is not protected against excessive scan rate. Abbreviated RSOD, sometimes called "Red Screen of Doom" is a nickname for the error message which existed in some beta versions of Microsoft's latest operating system, Windows Vista. It was dropped in Beta 1 (Build 5112) of Windows Vista. It can also be found (but rarely) in versions of Microsoft's Windows 98 operating system. The red screen of death also appeared in builds of Codename "Memphis". There is no RSOD in the official (current) release of Windows Vista. The Red Screen of Death appeared when boot loader errors occurred. Windows Vista continues to have blue screens for other types of errors. The Red Screen of Death also sometimes refers to fatal errors in recent versions of Lotus Notes. These errors are not full-screen like the Microsoft red or blue screens of death, but rather are bright red boxes with black borders. The Red Screen of Death can also be found on the Atari Jaguar System when an error loading a cartridge occurs. When this occurs, a roaring sound and the red Jaguar logo appear, and the background turns from black to red. This video shows it, with another video showing another game console, the PSP, having Red Screen of Death. There are other screens of deaths like green, white and yellow but not related to Computers much, so I am not highlighting them.